Their efforts started with bag of books. And then it was math kits. Now Kiwanis clubs of Niagara and Early Childhood Community Development Centre (ECCDC) are helping educate children across the region with their new science and technology kits. With the help of a two-year, $150,000 grant from the Ontario Trillium Foundation — along with $30,000 from Kiwanis Club, a $10,000 contribution from ECCDC and help from distributor Louise Kool and Galt — the kits are now starting to be handed out. A total 175 science kits have been put together for distribution at English and French child-care centres. Each kit costs $800 and has more than 30 hands-on educational tools to pique interest in science at a young age. 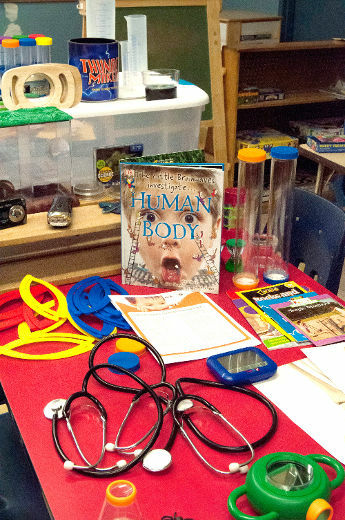 The kits — they include stethoscopes, a camera and compass and magnets — are geared to three- to six-year-olds. “The educators involved saw the value of getting kids hooked up and interested in science before they get to kindergarten,” said Welland Kiwanis Club president Ed Minchin. The two-year project was chosen from results of a survey to local child-care services, which ranked science and technology educational aids at the top of the wish list. The project has brought Niagara’s three Kiwanis clubs closer together, said Minchin. “I’ve been an educator all my life and the kits have been a real eye-opener for me,” said the retired principal. With so much in the new kits, ECCDC has designed 24 tutorial sessions for the 1,000 registered early childhood educators who will be working with them. “We provide training to all centres that get a kit with teaching strategies on how to use the kit, along with recommendations,” said Lorrey Arial-Bonilla, interim executive director of ECCDC.